Boo Halloween Card and Your Next Stamp Sale~60% Off!!! On another note, Your Next Stamp has some retiring stamp sets that are only available until September 30th!!! Karen has marked them down to 60% off!!! You only have a few days left, so hurry up and grab them before they are gone! I will be back on Friday for the Inky Impressions Blog Hop! Yes, I am part of the Guest DT and I'm sooooo excited about the new images!!! You are going to flip over their cuteness:) Thank you so much for stopping by and have a wonderful rest of your day! Hi Kerri!! This is so cute! Sorry I haven't been commenting as much, just busy busy, but I do read everyday!! Have a great day! OOHH! How wicked cute!! I love this layout and your image. Your card is so cute! I love the border punch here! Congrats on the guest DT! I love this card and so envious that you got that stamp set! Cute cute, very festive. That is a darling little ghost. Congratulations Kerri. I know you will do a wonderful job. Your card is adorable. Love it. What a great halloween card Kerri, wonderful! That goo border punch makes me laugh. I thought about getting it and didn't know what the heck for. What would one use it for. A-ha! 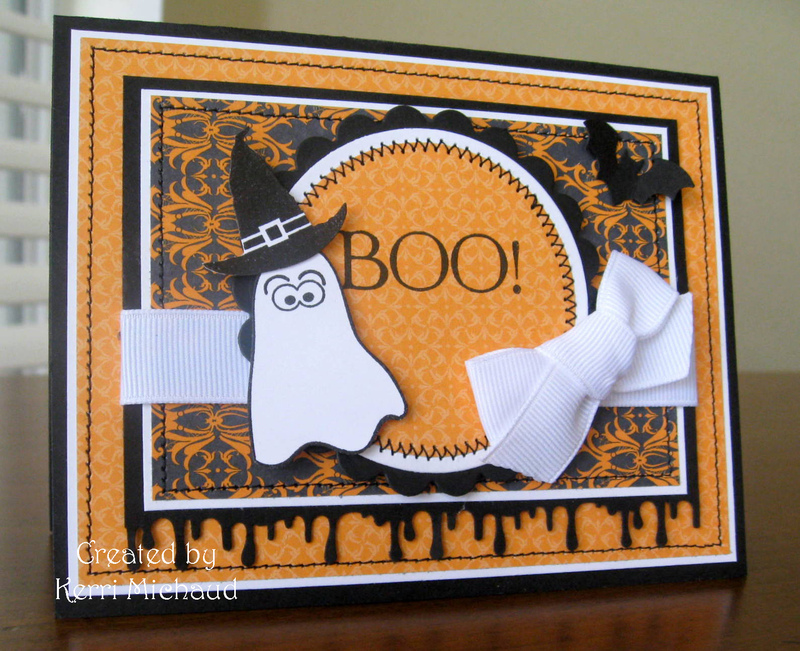 A Halloween card. It looks great - perfect use of it. Love that border punch and the white with the orange and black!! That white ribbon just makes the whole card WOW!!! Awesome design!! So fun! Love all the little elements that pair so well on this card!